5.0ft $230 $405 $493 $618 $930 80 cu.ft. 7ft $259 $496 $589 $757 $990 148 cu.ft. 8ft $336 $584 $674 $891 $1120 300 cu.ft. 10ft ﻿$﻿354 ﻿$﻿667 ﻿$﻿794 ﻿$﻿1023 $1440 512 cu.ft. 12ft ﻿$﻿420 $786 $937 $﻿1199 $﻿1980 812 cu.ft. 13ft ﻿$﻿600 ﻿$﻿1100 ﻿$1316 ﻿$﻿1704 ﻿$﻿2880 1232 ﻿cu.ft. 15ft ﻿$﻿840 ﻿$﻿1532 ﻿$﻿1834 ﻿$﻿2378 ﻿$﻿3720 1695 ﻿cu.ft. 17ft ﻿$﻿1320 ﻿$2396 ﻿$﻿2871 ﻿$﻿3726 ﻿$5160 2400 ﻿cu.ft. 20ft ﻿$﻿2340 ﻿$﻿4232 ﻿$5074 ﻿$﻿6590 ﻿$﻿7680 3884 ﻿cu.ft. 23ft ﻿$﻿2700 ﻿$4880 ﻿$﻿5852 ﻿$﻿7591 ﻿$﻿10,140 6003 ﻿cu.ft. 1-color, 2-color, 3-color, 4-color, or Full Wrap Art / Logo. *Logo/Artwork needed in Adobe Illustrator, EPS vector, or PDF vector formats. *Includes: Heavy-Duty PVC Construction, 2-sided Digital Graphics, Helium Hose, Helium Tank Fitting, Harness Lines, Main Anchor Line, Storage Bag, Instructions, 1-year Seams Defect Warranty. Increase Store Traffic & Sales 10%-20% IMMEDIATELY ! 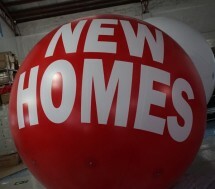 Imagine Your Logo on a huge eye-catching Advertising Ball floating directly above your location! At first it may seem like an unusual way to advertise. 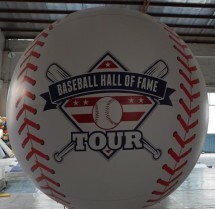 Yet, USA Outdoor Media's durable Helium Advertising Spheres offer an unbeatable way to increase store traffic and sales or trade show booth visibility. Heavy-Duty PVC material make these easy-to-use Helium Advertising Sphere Balls great for Retail (outdoor & indoor), and Trade Shows! 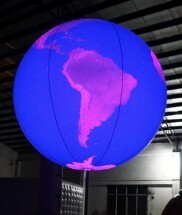 Helium Sphere Balls fly directly above your location at 10-15 stories high! Visible up to 1 Mile in All Directions (360 degrees)! Easy to put-up and take-down. Unlike a party-balloon that goes flat in 24-hours...retains helium for weeks! GREAT FOR RETAIL STORES OR TRADE SHOW BOOTHS. 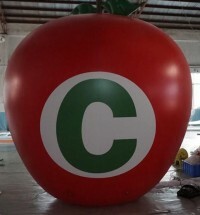 You can turn your business into a landmark for residents and prospective customers very easily. 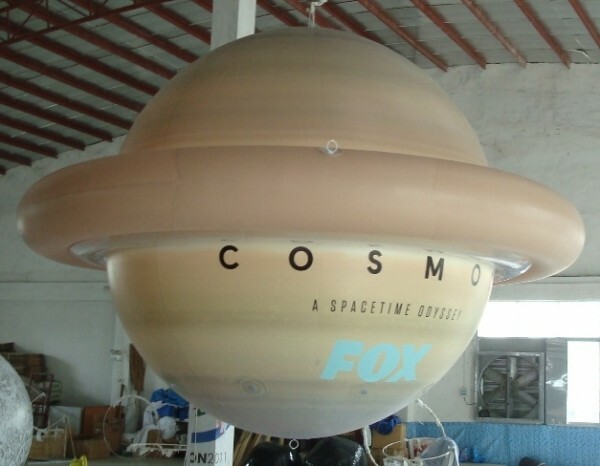 Helium advertising spheres (similar to helium advertising blimps) are great advertising tools for making your target audience aware of your business and interested in what it has to offer. 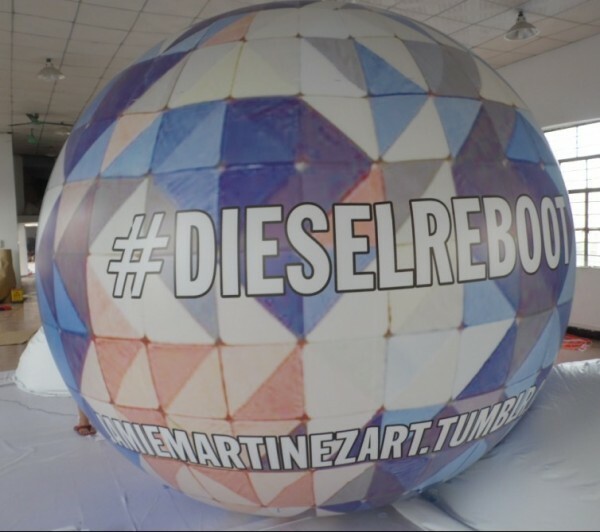 Our giant helium advertising sphere balls are designed to generate maximum visibility for your company’s marketing message, giving you a cost-effective marketing channel that is perfect for generating serious results. 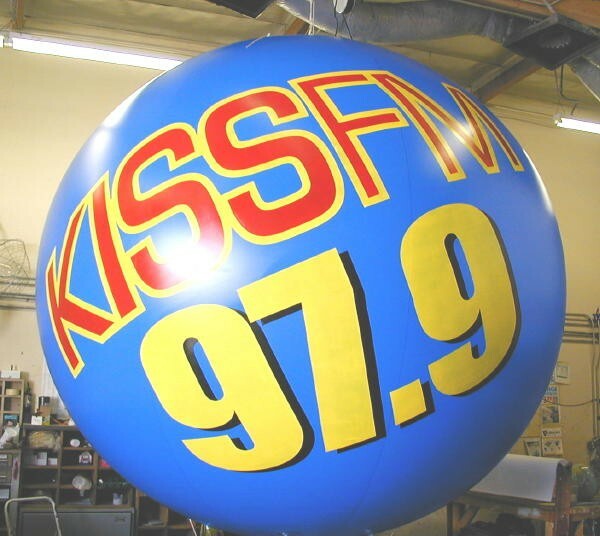 When used effectively to promote your latest sale or special deal, advertising spheres can outperform direct mail, print advertising, TV and radio by extending your retail signage for blocks or miles. Turn your business into a Local Event Every Day! Can you imagine the effects of a giant billboard sign floating 10 to 15 stories above your retail store or business location? 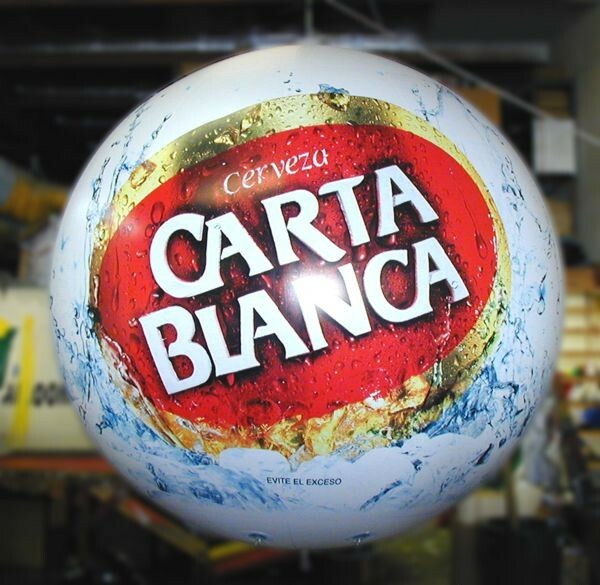 The key to effective advertising is visibility, and it’s hard to think of any marketing tool more visible than a helium advertising sphere ball. Our high quality advertising Spheres sit 10-15 stories above your business, giving it the ultimate tool for attracting customers and making passersby aware of its latest special deals and offers. 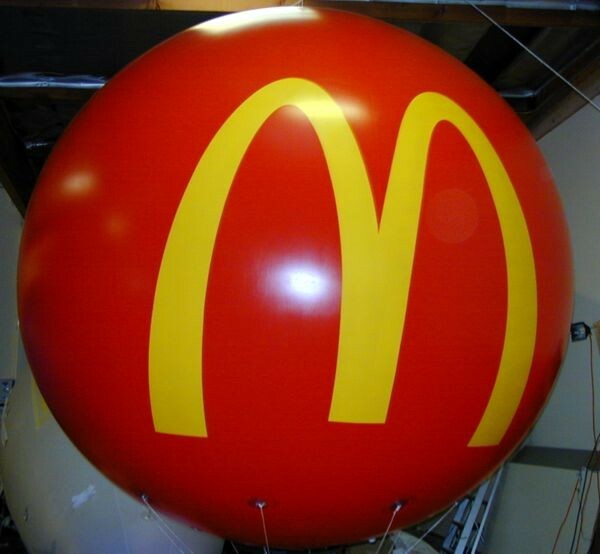 Visible from up to two miles away from your store, an advertising sphere ball can act as a powerful marketing magnet, drawing in customers and making the public aware of your company’s value proposition and selling points. Marketing isn’t just about visibility – it’s also about ensuring your company achieves the best possible return on investment. 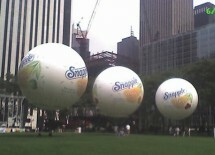 With the right message, advertising spheres can outperform print, radio and television marketing on an ROI basis. As well as generating a greater short-term ROI for your business, advertising balls are fantastic tools for increasing brand recognition and building a loyal audience of people who are aware of your business, its offers and its location. Better yet, our helium advertising sphere balls don’t just work well on their own – they’re also fantastic when used alongside traditional advertising campaigns. 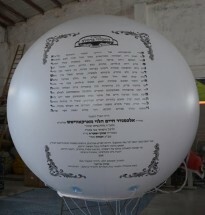 Benefit from a real synergy between print, radio and TV advertising and your marketing sphere balls. Would you like to make an impression and increase awareness of your retail store or location in your neighborhood? Visible from up to two miles away, spheres are an effective marketing tool for making everyone in the area aware of your store. 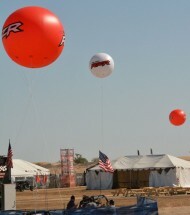 Retailers that use helium advertising sphere balls stand out from the crowd and attract a massive amount of attention. From traffic to passersby, anyone in the area can’t help but notice your company’s advertising blimp and become aware of your location. 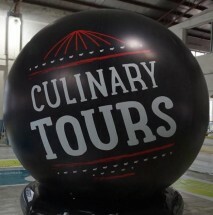 From branding your business as the local leader in its category to making each and every visit to your retail location an event for customers, helium advertising balls are a valuable marketing asset for your business. Help your company stand out from the crowd. Would you like to increase your retail location’s traffic, increase awareness of your business and generate a great ROI from your marketing? 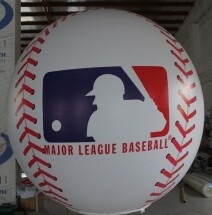 Our advertising balls are powerful and highly effective marketing assets for all retail businesses. Whether you’d like to promote a sale or special event, increase awareness of your business or simply stand out from the crowd, out helium advertising sphere balls are the ideal way to help your business achieve its marketing goals.